Turns out there's quite a lot to say, and the 140 Conference in Los Angeles earlier this week was the place to be saying it. The event attracted a mix of celebrities, techies, and those weird hybrids who are "Internet famous," yet could pass the average person on the street without so much as an eyeblink. What were some of the big announcements surrounding Twitter at the conference? • No ads yet Twitter co-founder Biz Stone reiterated that the site would not start displaying ads in 2009, saying that the company had secured enough funding to avoid seeking advertising revenue for now. Stone's low-key keynote speech eschewed any serious discussion of new features for Twitter, preferring to focus on the service's "social alchemy" in changing interactions among people, both online and off. "Tiny bits of information can have profound impact," Stone said, citing the service's use in sharing information about the Iran election protests. "Twitter is about the triumph of humanity, not technology." • "Premium features" Stone did say that the company would roll out "premium" features for corporate users, including analytical tools to enable better tracking of what their fans do, and how they use the service. • Location, location One big new feature wasn't quite ready for prime time at the conference, but was discussed nonetheless -- Twitter's new feature enabling users to add their full locational data to any tweet, tracking them as they post even if they're on the go. The company promised that the service would be completely "opt-in" by default, and any geolocational tweets would be scrubbed from the site's servers after 14 days -- both to protect the users' privacy, and to avoid potential subpoena issues for the company. • Third-party aps Numerous companies were making their debuts at the conference, but the spotlight was reserved for One Forty, the Twitter equivalent to the Apple iTunes store. Founded by Laura Fitton, author of "Twitter for Dummies," the service promises to herd together the best of the many hundreds of third-party apps for Twitter, rating and sharing them for users' benefit. The first day was a blitz of panels and presentations as speakers jockeyed to explain exactly what it was that made Twitter so successful, and how that success could be translated into big bucks. One panel was a collection of social media mavens and marketing experts discussing the best ways to build a brand on Twitter, moderated by venture capitalist Guy Kawasaki. The consensus from the speakers that it was more important to have passionate, interested followers who actively engaged with the business, than a large amount of passive followers who did nothing, and that fundamental principles of marketing -- trust, honesty, and attention to customers -- were the same on Twitter as in the physical world. "Twitter is just another conversation mechanism--same fundamentals of marketing in a different environment," said social media evangelist Mike Prasad. "Crisis management is one of the most important reasons to be on Twitter," said Starbucks' Brad Hunstable, noting the service provides an instant response system for any company to immediately address customer concerns. 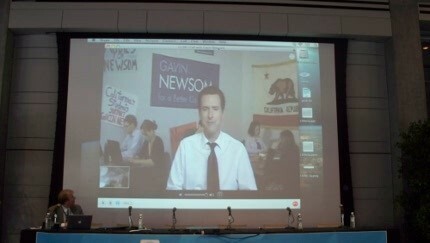 The morning was broken up by a Skype video message from San Francisco mayor and 2010 gubernatorial candidate Gavin Newsom, who phoned in to the conference to wax rhapsodic on "Government 3.0," and how "we are trying to use Twitter and this technology to improve the governing of this city," he said. Newsom noted how San Francisco was leveraging its troves of data and opening them up to the residents to use and create new applications for city services. "You don't make time for Twitter"
The conference took a lighter turn with the "Comedy Session," where humorists ranging from comedienne Loni Love to "Web Soup's" Chris Hardwick discussed using Twitter to "make themselves funnier." Hardwick made fun of Twitter users who placed special emphasis on bracketing time in their day to tweet. "You don't make time for Twitter -- you grout your day with it," he said. The comedy panel's big surprise was an appearance by The Iron Sheik, the former World Wrestling Entertainment superstar who experienced a resurgence in his career from expletive-filled YouTube videos and appearances on "The Howard Stern Show." The Sheik was largely quiet, preferring to speak through his assistant, but brought the house down with sudden profane tirades against his former arch-rival Hulk Hogan. Although very few attendees could understand what the Sheik was saying, it was memorable due to timing if nothing else. The dynamic mix of celebrities and techies continued with the "The Music Panel," where artists and record executives discussed using Twitter and other social media to promote their creations. Rapper Chamillionaire was the dominant speaker on the panel, relating stories of how he used MySpace to aggressively promote his songs, and emphasizing the need for direct connection between the artists and their most passionate fans. "People underestimate the intelligence of fans," he said. "They'll tell you what they like. They're not stupid." The final panel of the day was entirely given over to the celebrities, featuring "Star Trek: The Next Generation" and "Reading Rainbow" star LeVar Burton, skating legend Tony Hawk, Web superstar iJustine, and late-arriving actor/musician Tyrese Gibson, moderated by "Dr. Drew" Pinsky himself. 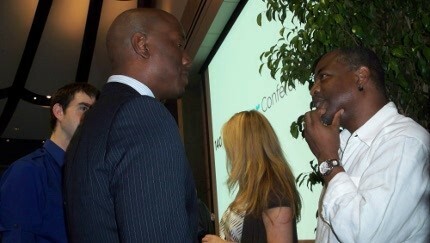 The celebrities offered a fresh perspective on using Twitter, with Burton passionately evangelizing it as "giving him his career back." "Nothing comes between me and the fans. No gatekeepers," Burton said. He and Gibson engaged in a passionate debate over how much a celebrity should share on Twitter, with Gibson saying it was important to maintain control of one's image and present a strong persona to the public. Gibson also summed up the feelings of much of the convention when he was asked about "ghost-Tweeting," where someone else posts tweets under the account holder's name. "I would never do that," he said. "That's kinda cheesy." The first day concluded with a party on the Skirball patio and a surprise appearance from Paul "Pee Wee Herman" Reubens himself, decked out in full costume, who gleefully posted his first tweet ever to a cheering audience. The second day of the conference was nearly completely hijacked by a two-hour presentation by motivational speaker and consultant Tony Robbins. Dressed all in black, the imposing, husky-voiced Robbins took the stage and enraptured the audience with tales of how he, a former Twitter skeptic, began to use it to directly engage in conversation with both people he admired (such as Virgin Airlines' founder Richard Branson) and people who disliked him. Robbins regaled the crowd with seemingly simple mantras, such as "80 percent of success is psychology, and 20 percent is mechanics." His speech often detoured wildly from any discussion of Twitter and involved the audience jumping around and engaging in personality-based exercises. Robbins came back to the topic with his admonition that "In order to know what influences people, you have to know what influences them already," and Twitter was a perfect tool to get instant reactions from people as to what drives them and makes them do what they do. After Robbins left, the conference struggled to get back on track, and was forced to merge or reschedule sessions. Truncated panels included those hat outlined the hundreds of third-party applications Twitter-ers can use, from desktop apps such as Tweetie and Tweetdeck, to tips and tricks to get the most out of the 140 characters. A spontaneous "unconference" panel held at lunch discussed the need for "hyperlocal" Twitter filtering, enabling people in particular cities and neighborhoods to get the most valuable and timely data via Twitter. The Los Angeles Times' social media architect Andrew Nystrom demonstrated the paper's "Mapping L.A." system, which provides readers real-time maps of Los Angeles' 32 neighborhoods, and is licensed under Creative Commons for reuse and modification by anyone who wishes. The conference wrapped up with a look at the future of Twitter. Although many of the panelists wondered why Google has yet to buy Twitter in order to make use of its formidable real-time search capability, the majority of the panel sidestepped obvious questions such as, "How can you make money off Twitter?" "This crowd's smarter than that. It's such a hack question," said Laura Fitton. Instead, the audience was treated to video displays of a flying robot that could be commanded remotely via Twitter posts, and discussions of how Twitter could be a precursor to direct telepathic communication between humans. More emphasis was placed on how mobile services will drive much of Twitter's growth as it expands to other countries. Fitton took time to criticize the U.S. wireless companies for "having their heads up their SMS" and not taking full advantage of text messaging, preferring to "charge on the margins" for every use of the service. The panelists agreed that Twitter and its many permutations took the world by storm due to the creativity and passion of the millions of "tweeters" who use the service. As Fitton put it, "Twitter didn't create Twitter. The users created Twitter." And with that, the 140 Conference came to an end, proving that as much as 140 characters forces you to stick to the point when tweeting, there's a lot more to be said about Twitter that can't be contained by any character limit.